What a beautiful and peculiar book. 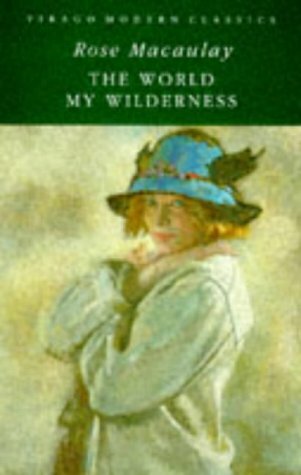 Rose Macaulay’s The World My Wilderness was her second to last novel. The first after a ten-year hiatus brought on by a lot of heartache and sorrow. In 1939 she caused an accident in which her lover was injured; in 1941 her apartment was bombed and she lost almost all of her possessions and then in 1942 her lover died. Before that Rose Macaulay was a successful author of mostly satirical books. The World My Wilderness is quite different; it’s a compassionate book that reflects her own sorrows as well as other elements of her biography, like childhood years spent in Italy. The book is set in the South of France, London, and Scotland. The main character, 17-year-old Barbary, is sent to London to live with her father and go to art school. The war is over and her mother Helen wants to get rid of her for different reasons. She and her step-brother have gone wild during the war. They joined the maquis (resistance), and may or may not have been involved when Helen’s second husband, Barbary’s stepfather, known as collaborator, was killed by the resistance. Barbary’s father has remarried as well and Barbary and her new stepmother, a very conventional woman, clash immediately. Barbary is profoundly miserable, misses her mother and France, but finds solace in the company of her stepbrother. Together they explore the ruins around St.Paul’s cathedral and discover that this wasteland bears some resemblance with their beloved maquis. The ruins are like a wilderness, and, like the maquis, populated by petty thieves and delinquents. Barbary, who is a talented painter, draws postcards of the ruins and sells them to tourists. The main story is about whether or not Barbary will be allowed to see her mother again and return to France. But since this isn’t a plot-driven novel, its strengths lie elsewhere. This is a book full of lush descriptions and fascinating characters. They are all flawed and complex and whenever we think, we know them, they do something that surprises us. One technique that contributes to see the characters in all their complexity is a frequent change of point of view. Often we’re introduced to a character, seeing him/her through her own eyes and then, right afterwards, we see them through the eyes of others. The result is quite arresting. My favourite character was Helen, Barbary’s mother. She’s a free-spirit who loves art, men, freedom, and a good life. Conventions are not for her. In France she lives as she likes, while she was a constant source of scandal and gossip in London. I expected The World My Wilderness to be a lot like Mollie Panter-Downes One Fine Day but it’s much more like a novel by Colette. Helen herself reminded me a lot of Colette and some of her heroines. She’s such an uninhibited, freethinking, sensual woman. While Helen is a cheerful woman, in love with life and love, she’s also a tragic figure because she was deeply in love with her second husband. The World My Wilderness is also excellent in the way it describes post-war London with its ruins and struggling population. Everything is still crumbling—the houses and the society. It’s a world in change in which destruction is found right along a wild, mysterious beauty. Summer slipped on; a few blazing days, when London and its deserts burned beneath a golden sun, and the flowering weeds and green bracken hummed with insects, and the deep underground cells were cool like churches, and the long dry grass wilted, drooped, and turned to hay; then a number of cool wet days, when the wilderness was sodden and wet and smelt of decay, and the paths ran like streams, and the ravines were deep in dripping greenery that grew high and rank, running over the ruins as the jungle runs over Maya temple, hiding them from prying eyes. I wish I had been able to review this book right after I finished it but that was just before German Literature Month. It would have deserved a more careful review. I still hope you can tell, that I loved it. It’s a marvelous novel. Hi, Caroline. Happy festive season to you and yours. I had never heard of this novel before, and look forward to reading it. A number of years ago, I was in a satirical novel course, and read a number of Rose Macaulay’s, and you are correct about her reputation mainly as a satirical novelist. Also, as you note of the one book, she is not really strong on plot, but tends to go for characterization, even at her most plot-driven. The book I have the memory of the most, and that is faint after all these years, was something which had the word “Trebizond” in the title, “Journey to Trebizond,” or “Road to Trebizond,” or something like that. The camels were (perhaps unintentionally) amusing. Thanks for your review. Hi, Victoria. I wish you a wonderful festive season too. I really loved this one. the charcaters are wonderful. The structure is very loose but it didn’t diminish my enjoyment. I’m looking forward to hear what you think of this. I’m glad to hear this is so wonderful – I have it my TBR and I’ve been meaning to read it for ages. A combination of Colette and a ruined post-War London sounds irresistible! It really is irresistible. The different settings work so well together and Helen is something else. I’m looking forward to your review. I’ve never heard of this novel before. It sounds fascinating! It really is quite special. It would make a beautiful movie. The images are very strong. Well, you’ve made me want to read it, so I’d say you did a very good review, Caroline! Have never heard of the author, but her life is so intriguing. If you put it in a book, no one would believe it. No, you wouldn’t. It’s a lovely book. I’d love to hear what you think of it. Thanks for this review, Caroline. It sounds very interesting, especially taking place in different locations and different points of view. I love your description post-war London “with its ruins and struggling population. Everything is still crumbling—the houses and the society. It’s a world in change in which destruction is found right along a wild, mysterious beauty.” I will check this out! Thanks, Jennifer. I hope you’ll like it. The descriptions of the ruins and life in the ruins was something I’d never seen described like this before. I should have mentioned that the book is out of print – or so it seems – but you can easily get cheap used copies. I got mine for unde 3$. I remember thar this was the book that I left behind in the library before I went to university that I really wanted to read, because it was dressed in Virago green, but never came back to me. That you think of Colette makes me think that it will be quite different from Rose Macaulay’s earlier work, some of which I read, and that it definitely is time I read this. The foreword says that readers were puzzled at the time as it was so different. Glad to hear it, Jacqui. I could have added tons of quotes but many were a bit long. Still, the second really gives a flavour of the book. I guess you could find it in a charity shop. I have never read Rose Macaulay. It is interesting that this book does not fit into her typical pattern of writing satire. I think that some folks who are able to express a lot of humor sometimes have a very tragic story to tell. I think in her case, having experineced so many tragic things made her a more compassionate writer. There are still funny or satirical moments in this one, but overall it’s not satire. I was wondering if you’ve read it because I thought this would be for you. I’ve only read one Rose Macaulay novel, I think it was called Crewe Train, and I found it a bit odd. I think I’d read a lot of glowing reviews of her novels so my expectations were too high (which is fatal to enjoying a book). I’d like to try her again. I might go with The Towers of Trebizond, though, which is the well-known one of her books. I adore Colette, so maybe a second encounter with her will be more successful. That can be very fatal. I agree. I think you’d like this one, although it miht not be as famous as The Towers of Trebizond, many readers consider this to be her best. Maybe because it’s the most compasionate. I’m catching up with posts, starting by the bottom of my inbox. I didn’t know this writer but it sounds like a marvelous novel. I like books with free spirits. It’s a fantastic book. I often wonder why I don’t just read all of my Virago titles, I’m rarely disappointed.